It's half past 11 at night. I'm sitting in my chair with boxes all around me. They have various markings and stickers on them, all to tell us what's in them on the other end of our move when we start unpacking. Philosophically, though, they represent the end of a chapter. I took a long run through the neighborhood tonight as a "walk" down memory lane. It is a combination route that allowed me to hit all of my regular routes in one. I enjoyed the run a lot, despite the fact that it was especially warm. I ran past churches, houses, a donut shop (I did NOT stop), and a police station. All of these things I have run past countless times in the three years I've been at this location, often without a second thought. San Diego has been so good to us this last time around. It represented a chance to start over in many ways. I was still very immature in my faith and as a man when I first got here for my tour on the Antietam. I needed to grow up a lot and I did. My kids have grown up a lot here as well, and this is the place where Samantha was born. We have had a great time at our church and now have many dear friends that we wouldn't have had were it not for this tour in San Diego. We have been blessed! Everyone in the house is excited about the move, including me. While Great Lakes wasn't my first choice, or a desire period, it is God's choice, and I am willing and able to go. Alicia is looking forward to homeschooling, the kids are looking forward to a yard, a dog, and snow, and I'm looking forward to teaching and doing God's work. I know this is the path prepared for us by God, and I am ready. Yet there is that one emotion that I never like feeling. I'm going to miss San Diego and even the USS Antietam. All of us are going to miss CEBC, our church home for the last three years, and I'm going to miss a lot of my Navy buddies. 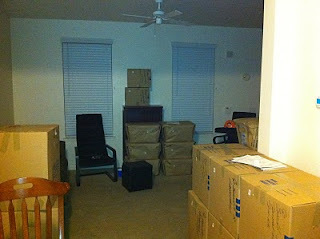 These boxes are a reminder tonight that, tomorrow, everything changes. It's a nice transition. Tonight, I get to reminisce and enjoy the last night in San Diego. Tomorrow...well, tomorrow can take care of itself. Beautiful post, Dan!! I can't wait to hear how about the new adventures God has for you at Great Lakes. Stephanie, I can't wait to have those adventures! LOL! Thank you, Don. As always.